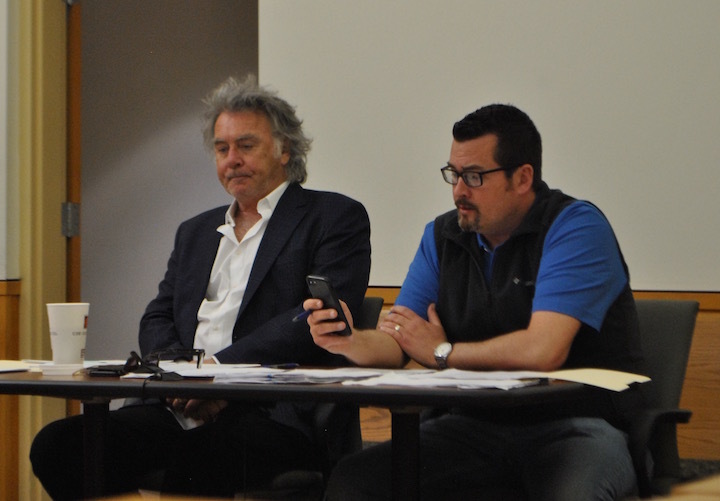 Pictured are council members Brandon Leeth, left, and Adam Wilkin. Also pictured are interim police chief Eric Daniels and law director Fred Beery. Hillsboro mayor Drew Hastings, left, and safety and service director Mel McKenzie. Hillsboro city council members voted to approve a $3 increase to city water fees and to accept a donation of a tract of land valued at $160,000 during their Monday, April 8 meeting, and they also heard about a potential “agreement” between the city and Parker House owner Jack Hope on the uptown property. However, approximately 25 percent of the meeting was devoted to complaints and allegations regarding Hillsboro auditor Gary Lewis, issued by several council members and Hillsboro mayor Drew Hastings. As previously reported, Culbreath, Claudia Klein and Ann Morris discussed a lack of additional reports from Lewis during their March meeting. Harsha and Morris both said during last month’s meeting that they would be contacting Lewis again. Harsha said that council had received “a very big report” from the auditor this month. 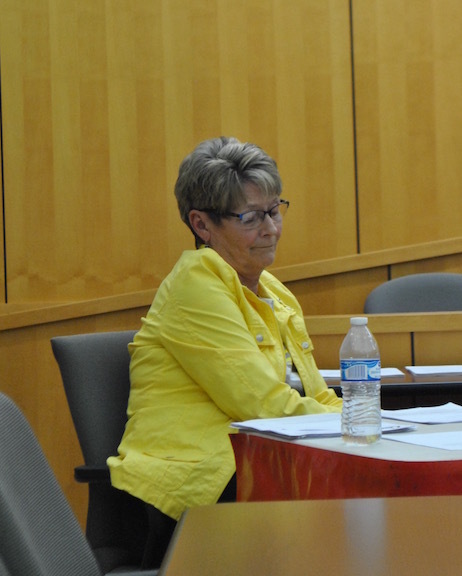 However, the three councilwomen – and Hastings – were apparently not satisfied. “I talked to Gary, and specifically, he needs to know exactly what you’re looking for, and I would be happy to work with both you and Gary to make sure you get exactly what you want,” Harsha told the council members. “He has given us a very big report, and we need to narrow that down. “I’m just at a loss that this is the first he’s even responded,” Culbreath said, alluding to a resolution passed by council seeking extra reports from the city treasurer (not the city auditor). As previously reported, during their December 2018 meeting, council voted 4-3 to approve a resolution stipulating that each month the city treasurer, Heather Young, will be required to report "the condition of the finances of the City of Hillsboro; the amount received by the City Treasurer; the sources of such receipts; the disbursements made by the City Treasurer; and on what account, during the year to date. Such account shall exhibit the balance due on each fund which has come into the Treasurer’s hands during the year to date.” The reports are currently required to be done quarterly instead of monthly, although council said in December they do not receive quarterly reports. Harsha repeated Monday that “we have extra reports here,” which prompted the mayor to lash out at Harsha. When Hastings responded that his office doesn’t “have any information like that,” Lewis at that time said “the administration has complete access” to all such information. Safety and service director Mel McKenzie said that he would cooperate with Lewis to provide such information to council during that meeting. 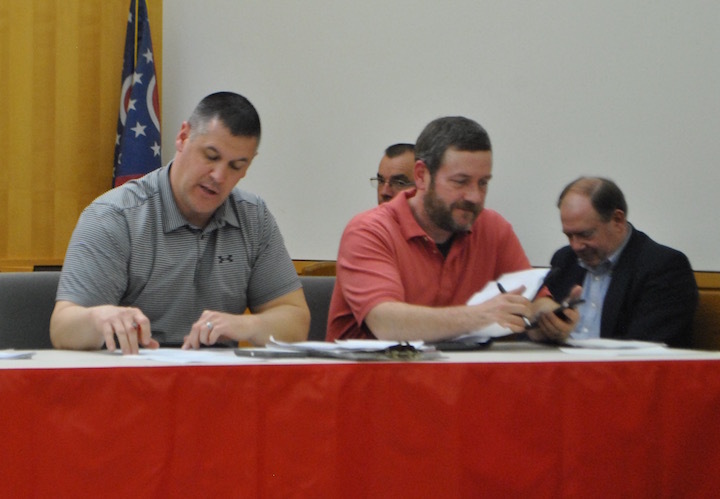 One year later, Lewis stopped attending council meetings, as Koogler announced during the November 2018 meeting that Lewis would be “no longer attending council meetings unless he receives three business days’ notice prior to a council meeting.” According to the Ohio Revised Code and city ordinances, there is no requirement for Lewis (or other administrators) to attend the meeting unless “specifically requested” by council. “Excuse me, but we have requested reports from Gary for the past two years, Ann and I have,” Klein said. “When he was here, he responded. He said I never asked him, and I have,” Morris said. “According to the ORC, if council requests his presence at a meeting, he is required to be here,” Klein said. “But it hasn’t been requested at this point,” Harsha said. “I request that he be here at the next meeting,” Klein said. “I will make that request,” Harsha said. Klein said that during the city’s audit, state auditors “recommended that [Lewis] prepare and provide to council the reports that we are asking for, that what he is preparing for council is not enough.” Culbreath then read a portion of the letter, saying that the state recommended that council receive “reports with detailed transactions” instead of only the year-to-date fund and bank reports that they customarily receive. “It was forwarded to us on Dec. 13, 2018, and then we did do a resolution,” Culbreath said, referencing the resolution for the treasurer’s reports. “If he has trouble understanding what it is we want, then he could have called any one of us or emailed us. “It’s been over two years we’ve requested this, and we’ve either been stonewalled or told ‘I’m not doing it,’” Klein said. Lewis declined to comment to The Highland County Press Monday night. The sidewalk in front of the property on West Main Street is currently closed. City administrators and Hope have been at odds over the building’s condition for many years, including the city filing a motion in 2010 in Highland County Common Pleas Court to order Hope to submit to inspections of the property and Hope filing several lawsuits against the city. In 2018, Hastings reported that he had “proposed that Jack take advantage of the city’s blight program,” but that Hope “did not want to do anything” at that point. Jack Hope told The Highland County Press on Monday, April 8 that it is “not exactly true” that he has any pending agreement with the city of Hillsboro regarding the Parker House property on West Main Street. Council voted 6-1 to adopt an ordinance to amend Section 51.36 of the City Code to provide for modification of the minimum usage charge for water usage. The $3 increase raises the minimum usage charge to $15.08 for the first 133 cubic feet — the second increase in a year, as the base charge was $9.08 at this time last year. The fee was last increased less than a year ago, in May 2018. The ordinance will help fund upgrades to the “aging infrastructure” of the water treatment systems, as discussed by council member and utilities committee chair Brandon Leeth at the February council meeting. Culbreath was the lone council member to vote against the ordinance. Council voted 7-0 to suspend the three-reading rule and to adopt a resolution accepting a 25-acre parcel of land donated to the city by Rita Blankenship and Bill and Janet Butler. According to the resolution, the property is “generally located at the termini of Greystone and Elizabeth Drives in the City of Hillsboro” and is valued at $160,000. There was no discussion of the resolution by council prior to the vote. McKenzie reported that the Ohio Department of Transportation will be completing a paving project during the daytime hours on Route 50 and to expect delays. Council member Mary Stanforth asked if the “citizens” in question were “owners of these rental places.” “Of course,” McKenzie said. Harsha placed the matter in the utilities committee. McKenzie also thanked members of the Hillsboro student council, who contacted him with ideas for improvements at Harmony Lake and Liberty Park. He said the students “are interested in planting a possible sunflower field and wildflower field” at the lake as well as making improvements to the dog park at Liberty Park, such as adding “dog agility structures” and planting trees. • Leeth reported that the utilities committee heard a presentation from former interim safety and service director Gary Silcott of Stantec regarding “the stormwater fee structure and how to fund the utility.” The committee has been working on a plan to repair and/or replace stormwater utilities within the city for several months. “We’d like it to be as affordable as we can, while also ensuring we fund it correctly, since this will be a department that will need continuous improvement funding,” Leeth said. • Stanforth said that the civil service and employee relations committee attempted to hold a joint meeting with the finance committee but did not have a quorum. Harsha asked McKenzie if there are “any sections of the code that you’d really like to see focused on first, rather than starting at the beginning.” McKenzie said that he had “several items” marked that he could give to Wilkin. Hastings reported that the planning commission granted a conditional use permit for 652 South High Street and encouraged citizens to complete the second “Imagine Hillsboro” survey on the city’s website, hillsboroohio.net. • Council voted 7-0 to suspend the three-reading rule and to adopt an ordinance to grant a temporary prescriptive easement to Carl F. Gamble to the area of encroachment along the alleyway on the east side of Lot 5 in the City of Hillsboro in order to settle a claim. Harsha explained that “a house was found, after a survey, to be overhanging a little bit in an alleyway.” City law director Fred Beery said that Gamble inherited the property after the death of his sister and had the survey completed, which revealed the encroachment. • Council also voted 7-0 to approve and adopt a resolution to transfer $100,000 from the General Fund line item Contingency to General Fund item Blighted Property. Mr. Herman, Mr. Lewis has always given information to council members and the public. I have seen several years of council packets. These packets always contained accounting for the month and year to date. Daily reports can be seen on the auditors computer. Keep in mind the daily figures are ever changing depending on daily activity of deposits and bills being entered as they come in and paid. Does the four other members of council have a problem with the reports or is it that the FAB THREE cannot read them? Now this folks is a WITCH HUNT! This comment has been hidden due to low approval. I am of the understanding that a third of the demolition budget went toward one of the mayor's properties last year. Funny, I don't remember any of the mayor's coterie of sisters commenting. With all this talk of budgets, who's committee did that fall under? Seems the way I remember is Mr. Lewis was the only one fighting against it. https://highlandcountypress.com/Content/In-The-News/In-The-News/Article/Safety-and-service-director-speaks-out-on-demolition-of-mayor-s-building/2/20/46891 This comment has been hidden due to low approval. Mr. Herman, I have personally made several public records requests of the city's financial balances and received them within a day or two in all instances. I took the time to do this in the legally designated way and was responded to in the legally designated way. I don't believe this is a case of a City Auditor trying to keep information in his hands alone for corrupt purposes--unlike your corporate example, city auditors have forensic accountants from the state examine the minutae of their behavior every single year and issue public reports on it. I suspect that in this instance we are dealing more with an Auditor who is trying to stay afloat above a great deal of incompetence. Just consider the resolution that the City Council passed that they are now referencing as of it makes some demands of Gary Lewis. It doesn't. It only references the requirements of the city Treasurer, not Auditor, to provide more frequent reports. This comment has been hidden due to low approval. "••••Editor's note: I have never had any issues receiving public information from the city auditor." There are many, many indications about his notions of unwarranted importance. You're not cognizant of his true personality but each time you defend him, I'm thinking maybe you are. ••••Editor's reply: Mario Angellio is a very nice name. This comment has been hidden due to low approval. I don't know Gary Lewis but not giving information and being the only one who can get the information is a red flag. Losing track and making mistakes or trying to just let things go and write them off is a real mess. Think of your personal checking account as well as your credit card account. You know what goes in and what goes out on a running balance basis. Why aren't all these accounts and funds put on a spreadsheet in real time that can be looked at any time? This should not be a secret or only accessible by certain people. These are public funds and should be public records accessible by ANYONE who wants to view it in real time. I worked for a company that lost millions of dollars this way. They didn't even know how much they lost. It involved a third party collection HMO premiums and then forwarding those premiums to us. The accounting director set it up. It turned out that the third party was the father of her child. We didn't discover this until after she resigned her job. The third party said "here is the payment for month Y" and then we said "wait a minute, this is payment for month X, the previous month, not for month Y." The forensic accountant who was brought in said the red flag is when ONLY one person interacts with the third party. I would say the CFO, the CEO and even members in the accounting department let alone the outside accounting firm who came in every year to perform mandated audits were all derelict in their duty. My hands are shaking as I type this. The mayor, council members, department heads and any citizen all have a right to know. These should be electronic records updated in real time and available on a read only basis. I can go the highlandcountyauditor.org and look up any property, see who owns it, what are the property taxes, are those taxes delinquent, what did the property sell for etc. State Treasurer Josh Mandel has done something similar for the state. Transparency, transparency, transparency. I'd like to have all income tax returns public and available on line for everyone and every corporation. ••••Editor's note: I have never had any issues receiving public information from the city auditor. This comment has been hidden due to low approval. Win A, Not just Hillsboro. The 2010 popuation of the county was 43.600.now 42971/ Hillsboro was 6605 now 6512. Greenfield was 4639 now 4555; 2017 Census data estimates and 2010 actual census data. Greenfield peaked in 1990 and is now down 11.6%. Greenfield, Ohio's growth is extremely below average. 89% of similarly sized cities are growing faster since 2000. The implication is growth has slowed for sometime. Less people equates to less taxpayers and even more so when the poverty rate is added in. The county is at 20.7 % The official US poverty rate is 12.3 percent, based on the U.S. Census Bureau’s 2017 estimates. The median property value has declined 116%. See https://datausa.io/profile/geo/highland-county-oh/ Thus It explains why my vacant residential unplatted parcle has dropped an estimated 45%, yet the county just bumped the 100% value by 20%. The county appraisal system is grossly unfair. I have heard complaints from other property owners that it is next to impossible to get a reduction. I will however pursue a reduction. Who to blame ? The politicians who the people elected the past 20 years. And the voters who did note vote. The bright side is acquiring a home in retirement now is lower than 1999 when I started tracking home prices. This comment has been hidden due to low approval. Just keep on taxing and Hillsboro will start losing citizens and businesses. This comment has been hidden due to low approval. Rory. I can see where finding any good buried in this article could easily be over looked. The Good is short. The donation of the 25 acres by Mrs. Blankenship and Mr. and Mrs. Butler. Two families with long ties to the community. Most people know these two families have contributed immensely to the community with their civic work and are known as outstanding citizens including the late Ernie Blankenship. This is an act of great potential value to the city. The question is, will the city put it to the highest and best use? I certainly hope so. If my memory serves me correctly, this parcel may include the old stone quarry where many a pick-up hockey game and fights amongst best friends took place in my high school days of the early 1970's. This comment has been hidden due to low approval. So many comments to write on this city council meeting, which resembles a "Kangaroo Court", I will have to break it up into three segments. The Good, the Bad and the Ugly. Ugly will be first followed by Bad, and in last place Good. •••Editor's note: Oscar, good luck finding the "good." This comment has been hidden due to low approval. Mr. Ryan and Team, would you be able to shed any light on Culbreath's source for that quote from the state auditors? I was unable to find what she was referencing in either the 2017 or 2018 Independent Auditor's Report issued by the state. Any idea what the letter she is referring to is? •••Editor's reply: Consider, maybe the answer is in Berrysville. Certainly not in Hillsboro. This comment has been hidden due to low approval.